Why Do a Cultural Equity Plan? Many cities across the country conduct periodic cultural plans or include an arts and culture chapter in their comprehensive plans. A growing number of those include an explicit equity approach, looking to ensure that diverse racial and ethnic communities are recognized in civic life, equitably served by arts and cultural offerings, and equitably invested in. This burgeoning approach is one step in the right direction toward achieving cultural equity. Through this primarily online tool, we have adapted a form of planning that explicitly focuses on cultural equity as a dynamic, regular practice: a Cultural Equity Plan. This tool provides guidance and resources for agencies and communities who would like to complete a plan that is dedicated to accomplishing cultural equity in their neighborhood, city, county, or region. By pointing to equity-focused approaches of cities engaging in this practice, it serves to promote equitable development through arts and culture. This resource is not a comprehensive cultural planning guide. We recommend "Developing a Strategic Cultural Plan: A Work Kit" by Louise K. Stevens for a more comprehensive look at cultural planning in general. The point of this tool is to demonstrate the equity components that can be applied to each stage of development of a Cultural Equity Plan. What is cultural equity? Cultural equity explicitly values the unique and collective cultures of diverse communities and supports their existence in physical spaces, in public policies and investment, and in expression in civic and spiritual life. A Cultural Equity Plan values interculturality—the recognition and support of diverse and distinct cultures and the bridging and sharing of those cultures to build strong and interconnected communities, towns, and cities. Cultural equity explicitly addresses legacies of structural racial discrimination and remedying of institutionalized norms that have systemically disadvantaged categories of people based on race, ethnicity, customs, gender identity, sexual orientation, age, religion, disability, and socioeconomic or citizenship status. Cultural equity reverses economic disinvestment to ensure healthy and thriving communities where people feel a sense of belonging. The development of a successful Cultural Equity Plan requires an intentional process. It generally will be spearheaded by an arts and cultural agency, but cannot be accomplished without integrated leadership by the arts and cultural organizations and businesses that represent and serve the diverse communities of color in a city. Furthermore, advancing cultural equity is not limited to any one sector. For instance, the departments of planning, transportation, parks, housing, economic development, and public works; and general or neighborhood-specific plans should also address and support cultural equity. Regardless of which sectors or place-based initiatives within a city are attempting to plan for cultural equity, intentional practices that contribute to an equitable plan include data disaggregation, participatory research, and creative design processes that manifest community visions. Building in resources and time for government staff and community leaders to deepen their expertise is critical to achieving consistent, meaningful racial and social equity practices. Please note: This tool is most useful in its digital form. On your computer or mobile device, you will be able to follow all the links highlighted to real-life promising practices of cultural and comprehensive plans generated across the nation. Each Tab below has a dropdown function. When you click on a tab, you will see a brief summary of what that section entails. There are also bulleted lists of key considerations with hyperlinks to Valuable Resources. We hope you find this tool valuable. Please reach out to us if you plan on using this guide and share your feedback on its efficacy. Contact axel@policylink.org. Every city or town or region has unique cultural histories, economic drivers, neighborhoods, and businesses, which means every Cultural Equity Plan will be different. There are key elements that jurisdictions should consider when drafting a Cultural Equity Plan: The sections below form the outline of what a Cultural Equity Plan should contain. The accompanying chart includes helpful considerations and links to valuable references that can help cultural planners embed equity in each element. View the chart. Below is a diagram that shows the process of how Oakland's civic leaders, advocates, and residents informed the development of the plan. Cultural asset mapping is a process for identifying the cultural assets that are most important to community life that should be preserved and built upon. While the process may include major institutions, think of it as a "beyond the opera, symphony, and major museums" exercise; it will include less obvious spaces where cultural heritage is "naturally occurring" and cultivated within ecosystems of local communities. The focus should be on collectivizing the knowledge and wisdom held by low-income communities and communities of color about the important cultural keystones of their neighborhoods, including places — such as barbershops, corner stores, food hubs, gathering plazas, and front porches; as well as people and identity — the residents of Filipinotown of Los Angeles, of the African immigrant district of Minneapolis; and the Mardi Gras Indians and Vietnamese communities of New Orleans. Like all aspects of equitable planning, this intentional engagement and co-development is what makes the process and outcomes more inclusive and impactful for traditionally marginalized community members. A landscape analysis characterizes findings of the cultural asset mapping, contextualizes key factors of arts and culture impacts in local economies, documents development patterns, and population shifts, and characterizes the arts and culture investment landscape. It should identify the key barriers to disadvantaged communities' participation in arts and culture programming, and the necessary ingredients to realize equitable outcomes. Identify, build capacity, and welcome new participants from underrepresented communities to contribute data, interpret findings, recommend directions. Be sure to survey artists and cultural producers from underrepresented communities. Summarize what was learned in asset mapping, and characterize existing processes, plans, materials, gaps, and assets that constitute the cultural ecosystem of the city with a clear focus on communities of color and/or other vulnerable communities. What are the key current resources that invest in arts and cultural amenities and programming, both public and private? Create an inventory of the key resources (hotel/transiency tax, general fund allocation, economic development or workforce investment funds, contracts, procurement, tourism investments, transit projects, philanthropic investment, etc. ), and evaluate their equity impacts — who benefits, who pays, who decides? Have they geographically privileged some areas over others? Some communities over others? What are the existing conditions? Identify strengths, weaknesses, opportunities, and threats (SWOT), particularly related to low-income communities and communities of color. CreateNYC (pp. 42-45) maps and summarizes the challenges and opportunities that were lifted up through the asset mapping and community engagement process. This is helpful in setting the table and showing where there are gaps and where an equity focus would be beneficial. Where is the city now in terms of equitable access to arts and cultural amenities? Are arts organizations and cultural institutions readily accessible to lower income communities and communities of color? (See CreateNYC map on pg. 41). Are the aforementioned arts and cultural organizations being invested in equitably? If not, does the case need to be made for why investments in these institutions are not only good for the community, but also the economy? CreateNYC's Economic Impact of the Arts section (pg. 39) outlines the positive influence arts and culture have on New York's economy, making the case for why continuous and increased investment is important. Integrate this argument into your plan and emphasize the need for low-income communities to achieve cultural equity. What are the artistic and cultural production space needs in the community and how can they be met? This includes defining cultural spaces (as Seattle's CAP Report does on pg. 20), documenting their existence, and analyzing the equity implications of who is served and who is left out. Example: The Illinois Arts Alliance conducted cultural asset mapping that included a survey of Chicago residents in how well they were served by arts and culture programming (Chicago Arts and Culture Public Opinion Poll 2014). People in the Southside and Westside of Chicago reported being underserved. When private and public venues and city grantmaking were mapped, resident perceptions were verified. This study led to collaboration between the City of Chicago and local philanthropy to co-invest in underserved communities. What policies or practices contribute to exclusion or underserving of communities of color or artists of color? What policies or practices could enhance access, investment, or procurement of cultural spaces or programming in underserved cultural communities? The CAP Report is an excellent resource for generating ideas around how to "create, activate, and preserve cultural space." It includes strategies like certifying cultural space, changing building codes, and protecting older buildings. What is arts and culture's role in the economy (tourism? entertainment? revenue for the city?) Americans for the Arts provides national framing of the role of arts and culture in the economy, and they provide local data for 182 regions that can center the economic impacts of the sector. Example: CreateNYC's Economic Impact of the Arts section (pg. 39) outlines the positive influence of arts and culture on New York's economy, making the case for why continuous and increased investment is important. Use data to make the case that investing in arts and cultural institutions in underserved communities can be a source of revenue, in addition to improving lives. What impact does arts and culture have on a community's social fabric, particularly for underserved communities? CreateNYC (pg. 43) highlights data that show how the presence of a higher concentration of cultural assets in neighborhoods marked by disinvestment significantly corresponds with decreases in poverty-associated medical conditions, teen pregnancies, and crime rates (pg. 43). This helps center arts and culture as part of a proactive equity solution to real-life problems facing low-income and communities of color. Determine the range of relevant business activities in the arts and creative economy. Oakland included the categories of businesses used by Americans for the Arts, but went beyond them to capture less traditionally "artistic" activities that are relevant to Oakland. Their universe, largely consistent with other studies, added two other categories: drinking places/cabarets, and agents/managers for artists and entertainers, to reflect engagement with Oakland's vibrant entertainment sector largely driven by communities of color. They then documented all the arts and culture nonprofits and collectives and informal groups funded by philanthropy in the city, mapped them, and conducted an economic impact analysis of all these activities. Their methodology is described in depth here. What influence does arts and culture have on housing, transportation, healthy food, and job opportunities? See Creating Change through Arts, Culture, and Equitable Development: A Policy and Practice Primer to find out how arts and culture can advance equity goals in other sectors. Pasadena's Cultural Resources and Characteristics section (pp. 24-26) builds off the historical context setting and acknowledges the changing cultural landscape of the city which are a result of shifting demographics, real estate market pressures, and new community priorities. Identifying and incorporating disaggregated data is crucial to understanding disparities and opportunities in your community. Having up-to-date data on demographics, climate, health, and housing in your region will help set the context for your equity plan. There are a myriad of tools and resources available that will help you better plan for cultural equity. First, document the trajectory for demographic population change in your city and how this informs the cultural plan. The National Equity Atlas is a comprehensive resource for data to track, measure, and make the case for inclusive growth in America's cities, regions, states, and nationwide. The Atlas contains data on demographic change, racial and economic inclusion, and the potential economic gains from racial equity for the largest 100 cities, largest 150 regions, all 50 states, and the United States as a whole. Consider local, regional, and national data sources to get the full context around housing, health, environmental justice, and other factors that influence a community's cultural equity. The National Equity Atlas - a tool that uses city, state, and regional data on demographic change, racial inclusion, and the economic benefits of equity for the 100 largest cities, 150 largest regions, all 50 states, and the U.S. The CDC's 500 Cities Project - this tool for local data on chronic disease risk factors, health outcomes, and clinical preventive service can be helpful in thinking about how access to health services may be correlated to access to cultural institutions. AFFH HUD Data and Mapping Tool - this tool allows you to identify racially and ethnically concentrated areas of poverty (RECAPs) in your jurisdiction. Other data include school proficiency index, job proximity index, and housing cost burden—all important factors to cultural equity. The National Opportunity Index - this tool ranks and scores counties using economic, educational, community, and health measurements. The EPA EJ Screen - this tool allows you to generate reports about various environmental justice factors that characterize your region, including hazardous waste proximity and lead paint indicators. RedFin Walk Score/Transit Score/Bike Score - this tool measures how easy/difficult it is to move around your community via walking, transit, and bike. This section should name committed and potential partners that will be necessary in the implementation process. It should identify public sector partners who have shown commitment to equity, and equitable development and inclusion in the past; or partners who control resources and can be more proactive in their efforts to achieve equitable results. Work with your housing, health, transportation, parks, and other departments to implement arts and culture strategies to achieve cultural equity in your city. Parks and transportation departments play outsize roles in creating shared cultural and gathering space or alternatively, in disrupting connected communities. Cultural equity planning can be critical in ensuring the former outcomes. Form inter-agency partnerships. Think about how inter-agency partnerships can be helpful in achieving equity — the Local Government Support for Culture and Where There's Work to be Done sections (pg. 8-9) highlight a number of inter-agency partnerships who are bringing more cultural programming to underserved communities. Examine the spatial distribution of cultural assets. Think about the geographic and physical challenges to accessibility to cultural assets. CreateNYC states, "The cultural plan is not a housing plan or transportation plan, but these crucial factors must provide the context for our plan to succeed" (see "Where There's Work to be Done," pg. 9). Ideally, cultural institutions will both be located in low-income and communities of color, as well as accessible by public transit options to other neighborhoods of the city. Invest equitably. Consider implementing an approach like New York's Cultural Development Fund, which supports 900 nonprofit organizations that provide cultural programming throughout the city. It focuses on local audiences, often in New York's most underserved neighborhoods (pg. 22). Expand access to funding. Consider new public-private partnerships to streamline information systems and communicate cultural funding opportunities more effectively (City Wide Coordination & Health of Cultural Sector sections, pg. 15). Strengthen disability access. The plan should take a distinct look at accessibility for people with disabilities (accessibility via transit, ramps and curb cuts, as well as within and around buildings), and accessibility for neighborhoods with low auto ownership. Build on philanthropy's role in cultural preservation — the Neighborhood Character section outlines how a city program called Building Community Capacity joined with private philanthropy to increase support for local arts and culture in low-income underserved neighborhoods (pg. 13). Integrate culture formally into all city planning efforts. Consider implementing a Building Community Capacity Unit — an initiative to ensure that culture is included as part of interagency efforts around neighborhood planning, affordable housing, and economic development (pg. 24). Promote inclusion across cultural organizations. Consider the Diversity, Equity and Inclusion initiative launched in 2015 to study, promote, and cultivate equitable representation among the leadership, staffs, and audiences of cultural organizations in NYC. Push Cultural Plan legislation, which shows the importance of pairing cultural planning with actual policies and legislation to be able to implement the vision. The legislation gives the plan legitimacy (pg. 25). Cross-Sector Partnerships (Equity Examples) — See Creating Change through Arts, Culture, and Equitable Development: A Policy and Practice Primer for more ideas. Equity Policy: Leverage transportation planning, capital, and operating resources to co-develop and support cultural corridors, hubs, and commercial districts serving low-income communities, people with disabilities, and communities of color. Arts and Culture Strategy: Use transportation investment to create new or connect to existing cultural amenities in underresourced communities. Equity Policy: Prevent displacement of artists and communities of color. Arts and Culture Strategy: Include affordable artist housing and workspaces for artists of color, culture bearers, and tenured community artists in strategies to expand affordable housing supply. Equity Policy: Create strategic open spaces and parks in low-income communities and communities of color. Arts and Culture Strategy: Designate parks and open space for cultural programming in underserved communities that reflects the diversity of the neighborhood. Equity Policy: Target resources and support to low-income communities and communities of color, especially those with high levels of violence, incarceration, and poverty. Arts and Culture Strategy: Allocate health care, prevention, and arts and funding streams to arts and cultural practices that address trauma and health disparities. Equity Policy: Increase access, capacity, and knowledge to use technology in low-income communities and communities of color. Arts and Culture Strategy: Partner with arts and culture organizations to create culturally relevant means through technology to engage public input from underrepresented communities. Equity Policy: Expand and establish set-asides of capital project funds across federal, state, and local infrastructure and public and commercial buildings to ensure equitable cultural investment in low-income communities and communities of color. Arts and Culture Strategy: Invest set-asides of capital projects (e.g., water, schools, transportation, public facilities) in cultural facilities, programming, and public art in low-income communities and communities of color. Equity Policy: Direct arts and culture funding and programming to communities of color and low-income communities. Arts and Culture Strategy: Address barriers in grant application processes to enable arts and culture organizations who serve underserved communities to successfully compete for funds. Equity Policy: Build capacity and increase economic opportunities to underserved youth of color. Arts and Culture Strategy: Develop school internships and summer workforce programs in cultural arts industries targeting disadvantaged and disconnected youth in high-unemployment communities. The purpose of this section is to outline the goals of the Cultural Equity Plan and steps for implementation. It should identify resources, policies, partnerships, outreach strategies, technical assistance, and any other measures that will be used to achieve these goals. It is important to set goals that address what is laid out in the Landscape Analysis section, and that are reflective of the values and principles that were identified in the collective vision. 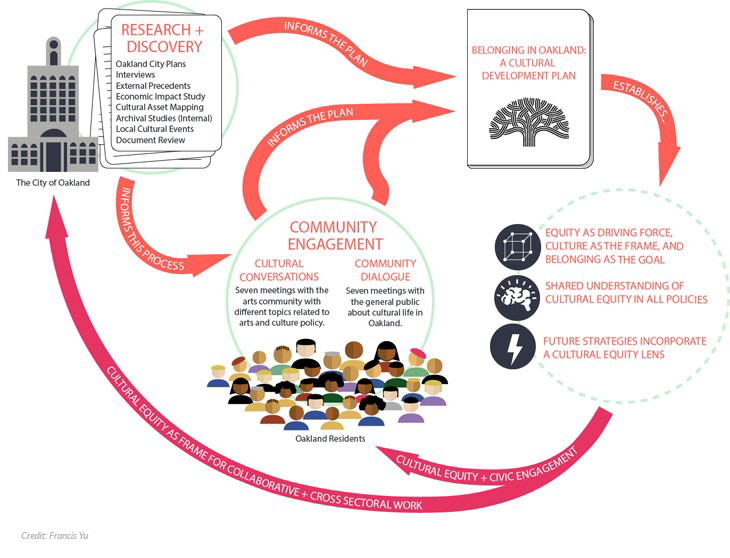 Lay out the short-term and long-term goals and objectives of the Cultural Equity Plan that address access, design, investment, procurement, and revenue within and for communities of color, low-income communities, and artists and cultural workers of color. Why these goals, and how will they help you achieve a more equitable society? How will they help you address the disparities you identified in the Planning Process, Asset Mapping, and Landscape Analysis sections? How can the economic role of arts and culture be strengthened and targeted to deliver on equity? Build on the demonstrated economic impact for communities of color in so far as possible. See Americans for the Arts' Arts and Economic Prosperity 5 to help build the economic case for your plan. AFTA's fifth study of the arts and culture industry's impact on the economy demonstrates that communities are investing in an industry that supports jobs, generates government revenue, and is the cornerstone of tourism. This is especially important in the context of communities that are traditionally undervalued, underserved, or disinvested. See Boston's Goal 3 (pg. 8). It explicitly calls out equity and outlines strategies for achieving the goal of "cultivating a city where all cultural traditions and expressions are respected, promoted, and equitably resourced, and where opportunities to engage with arts and culture are accessible to all." Nashville's Strategic Plan Explained (pp.8-12) lays out an excellent summary of its goals, strategies, activities, and outcomes in a clear and concise format. And Pasadena's plan (pp. 45-63) offers strong examples, explicitly identifying possible implementation partners for each proposed activity, as a form of building accountability to cultural equity. These are good examples of how to outline your plan and timeline for implementation, but a Cultural Equity Plan will have strong, explicit equity considerations boldly detailed in this section. Nashville Metro Arts Thrive Program — Recognizing that grants did not reach communities that lacked experience, awareness, and language capabilities to compete for funding, the Metropolitan Nashville Arts Commission developed the Thrive program. It awards contracts of up to $4,000 directly to artist and neighborhood culture activators, without the formal, often cumbersome reviews of the standard grant process. There is a simple two-page application, and the agency provides tutorials, coaching sessions, language support, and neighborhood "shop talks" at community centers and other gathering spots that seek to meet residents where they are to cultivate their participation. The pilot program supported over 200 artists, 67 percent of whom are artists of color and proved to be so successful that the city council increased funding from $40,000 to $100,000 the following year. This section should thoroughly outline the steps that will be taken to achieve the goals set out in the previous section. The scale of ideas will operate in different time frames; therefore, the plan you create should be adaptable (e.g., dismantling elevated interstate highways or prioritizing space usage into new building requirements). Do not delay things that can happen in a shorter time frame, and ensure equity aspects are advanced first and robustly to continue to co-develop realization of the plan with the city's diverse cultural communities. Set out short-term, medium-term, and long-term strategies/goals and identify implementation steps to realize each. Nashville demonstrates pathways to achieve those goals. Nashville's five-year work plan is a great visual display that clearly marks tactics, ongoing activities, and denotes short-term and long-term activities for each of its strategies. Be sure to embed systems that can support equitable development processes. Identify what sort of infrastructure you'll need to achieve your goals. Oakland's Cultural Plan, Belonging in Oakland, highlights the importance of building internal infrastructure for cultural equity (e.g., staffing, commissions, advisory bodies, see pp. 104-113). Belonging in Oakland calls for building out and strengthening staffing, programming, grants approval processes, and other components to ensure a strong infrastructure for implementing cultural equity programs. Identify and plan for the timelines of city budget processes; recommend and support equity champions to fill boards and commissions openings; and keep track of other legislative timelines to recommend changes to further codify the equity agenda. Identify policies that will need to be amended or added to achieve the implementation of your equity goals; establish a timeline and identify equity champions (both inside of government and outside of government) for accomplishing these changes. Updates on ongoing activities and implementation accomplishments should be posted to the plan's website at least once a year. Boston Creates' Year One Update describes milestone accomplishments over the course of the first year. The updates should outline if and how the equity goals were met, and if they weren't, what steps are being taken to make sure they are achieved. The Arts and Culture Element (Chapter 14, pg 2) of the District of Columbia Comprehensive Plan outlines the equity policies they have put in place that will help them reach their goals. CreateNYC is a strong example (starting on pg. 78). CreateNYC clearly outlines their strategies and objectives and highlights important factors like time frame, involved partners, and priorities for each one. Consider these valuable resources as a foundation for the Timeline and Implementation sections, but remember to explicitly focus and include the equity implications of the plan. Americans for the Arts, Arts & Economic Prosperity 5: The Economic Impact of Nonprofit Arts & Cultural Organizations & Their Audiences. accessed November 4, 2017. "Arts and Culture Plan," The Civic Arts Commission of the City of Berkeley, August 2004. Accessed November 2, 2017. "Boston Creates," City of Boston, accessed March 2018. "The CAP Report: 30 Ideas for the Creation, Activation & Preservation of Cultural Space," City of Seattle, accessed November 4, 2017. Center for Community Mapping - a site that collaborates with local organizations to provide interactive mapping applications for communities. "Comprehensive Plan: Arts & Culture Element," DC Office of Planning, accessed November 4, 2017. "Crafting a Creative City: The Metro Arts Commission Strategic Plan 2020 Metro Arts Nashville," Metro Arts Nashville, accessed November 4, 2017. "Create NYC: A Cultural Plan for All New Yorkers," NYC Cultural Affairs, accessed November 2, 2017. "Cultural Nexus: An Action Plan for the Cultural Sector in Pasadena," Pasadena Arts Commission, accessed November 4, 2017. "Engage CNY: A Regional Cultural Plan to Boost the Livability and Economic Vitality of Central New York, 2015-2025," Central New York Regional Economic Development Council on the Arts. Accessed November 2, 2017. Kalima Rose, Milly Hawk Daniel, and Jeremy Liu, "Creating Change through Arts, Culture, and Equitable Development: A Policy and Practice Primer," PolicyLink 2017. National Equity Atlas, PolicyLink. Accessed November 2, 2017. National Endowment for the Arts Asset Mapping. Accessed January 12, 2018. Participatory Asset Mapping Toolkit, Advancement Project. April 2012. Accessed January 12, 2018. StreetwyzeNeighborhood Navigator, Accessed January 12, 2018. Tony Fuller, Denyse Guy, and Carolyn Pletsch. "Asset Mapping: A Handbook," Accessed January 12, 2018. Vanessa Whang, "Belonging in Oakland: A Cultural Development Plan [Draft]," Cultural Affairs Division, City of Oakland. Accessed May 12, 2018.